CARMICHAEL, CA (MPG) - Change can often be good. Getting together with friends and neighbors to celebrate can be even better. The Carmichael Chamber of Commerce held a grand opening and ribbon cutting event to celebrate the new management and name change at one of central Carmichael’s senior living facilities. Braving the rain and wind storm, dozens of local business owners, friends and residents gathered for some simple fun, good food and networking at the after-hours event. 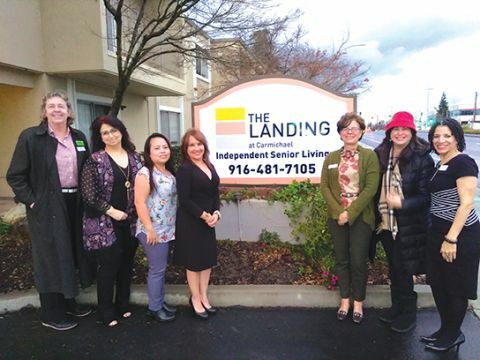 The Landing, formerly known as Sagebrook, has transitioned to an Independent Senior Living environment. During the change they have made many improvements to suit more independent lifestyle seniors. 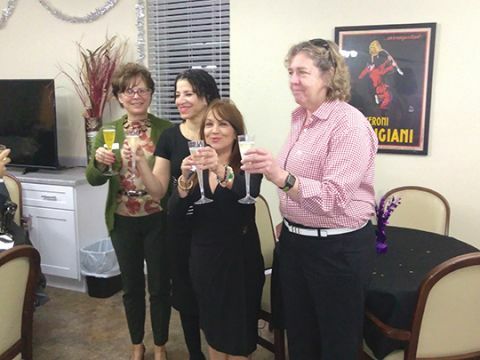 Sales Director, Jennifer Valcazar, presented a special toast to all of her staff, thanking them for making it a great place to work and for all the love and care they’ve given their residents. The grounds offer a quiet, quaint and beautiful living setting amongst large redwood trees in a secured gated community, and a fabulous and affordable retirement living option in the sought-after Carmichael neighborhood. A tour of the facility was available to those attending the grand opening. You could see the environment was one where our residents feel valued. It’s evident that their goal to make sure every resident in our community loves their stay. They offer spacious studio and one bedroom suites, offering full size kitchens, private patio, meal programs, transportation and activities. The team is experienced in working with seniors and has made a solid commitment to help and give back to those who built this community. The culinary team has worked hard to develop an innovating and inviting “Farm-to-Table” Dining Program that pleases even the pickiest of eaters. These Independent Living apartments are filled with residents that have retired and have a desire for a more relaxed lifestyle. Some of the newest residents have come from the Northern California Camp Fire areas and have grown to really appreciate their new neighbors here in Carmichael. The Landing is located next door to Carmichael Park, with its 38-acre park offering a dog park, off-leash area, sports fields and courts, picnic shelter, and the band shell which holds many concerts and events. Find out more about the Carmichael Chamber of Commerce at www.carmichaelchamber.com. If you own a business, call 916-481-1002 to learn more about how the chamber can benefit you.